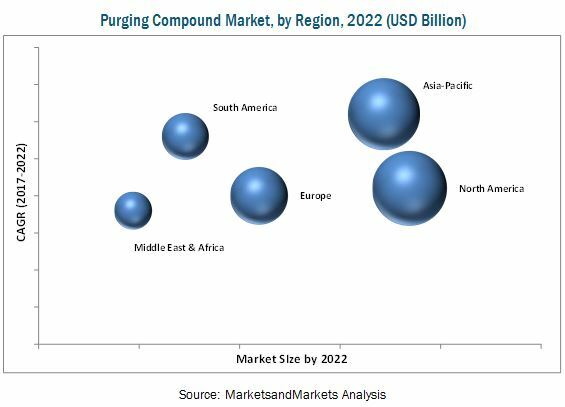 [141 Pages Report] The purging compound market is projected to grow from an estimated USD 450.7 million in 2017 to USD 586.3 million by 2022, at a CAGR of 5.4% from 2017 to 2022. Purging compounds help reduce machine downtime, production costs, and raw material wastage, which is a major factors that is contributing to the growth of the purging compound market. 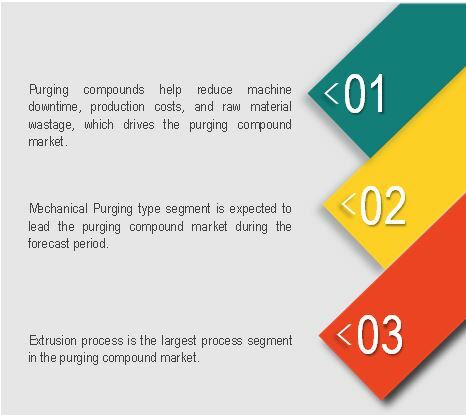 Purging compound market is segmented based on type, which includes mechanical purging, chemical/foaming purging, and liquid purging. Based on process, purging compound market is segmented into extrusion, injection molding, and blow molding. In this study, 2016 has been considered the base year and 2017-2022 as the forecast period to estimate the purging compound market size. Purging compounds are widely used for effective cleaning of plastic processing equipment, as they consist of scrubbing granules, which penetrate into dead spots and hot spots of machines to remove carbon buildup comprising layers of separated additives and degraded polymers. Purging compounds are required for normal cleaning of plastic processing machines to eliminate color changes in the finished products, resin or raw material changes, formulation changes in machines, and routine shutdown of industrial operations. Purging compounds not only ensure effective cleaning of machines but also facilitate quality control, which is critical for extending the operating life of machines. Manual cleaning of large machines is a time-consuming process as it involves disassembling of different parts of machines. It also leads to increased pressure on the overall operational activities carried out in various industries, thereby affecting productivity. Moreover, there is always the need to manage bottom-line costs of industries to stay competitive and profitable. Thus, machine downtime is neither competitive nor profitable. Use of purging compounds for cleaning machines lessens the machine cleaning time, reduces raw material wastage, leads to minimum rejection of final products, and also enables reuse of raw materials. Secondary sources such as company websites, directories, and databases such as Hoovers, Bloomberg, Chemical Weekly, Factiva, and other government and private websites have been used to identify and collect information that is useful for this extensive commercial study of the purging compound market. Primary sources, which include experts from related industries, have been interviewed to verify and collect critical information as well as to assess the prospects of the market. The top-down approach has been implemented to validate the market size. With the data triangulation procedure and validation of data through primaries, the exact values of the overall parent market size and individual market sizes have been determined and confirmed in this study. The breakdown of primaries conducted is shown in the figure below. Huge investments are being made by various key companies, such as Asahi Kasei Corporation (Japan), Chem-Trend (China), Purgex (U.S.), Dyna-Purge (U.S.), 3M Company (U.S.), Clariant AG (Switzerland), VELOX GmbH (Germany), E. I. Du Pont de Nemours and Company (U.S.), Kuraray Co., Ltd. (Japan), Daicel Corporation (Japan), The Dow Chemical Company (U.S.), Formosa Plastics Corporation (Taiwan), CALSAK Corporation (U.S.), Reedy Chemical Foam & Specialty Additives (U.S.), Magna Purge (U.S.), and RapidPurge (U.S.), among others to meet the increased demand for purging compounds from the growing plastic processing equipment industry across the globe. In September 2016, Asahi Kasei Chemicals Corporation launched the UF2 Grade purging compound, which is ideal for blown and cast film extrusion applications and injection molding. In December 2016, VELOX launched CleanPlus Express Purge Compound, which is highly efficient in terms of time-saving and excellent cleaning ability, which are suitable for extrusion and extrusion molding. In June 2015, Sun Plastech Inc. (New Jersy), a subsidiary of Asahi Kasei Chemicals Corporation acquired NOVACHEM (Connecticut), a manufacturer of purging compounds. 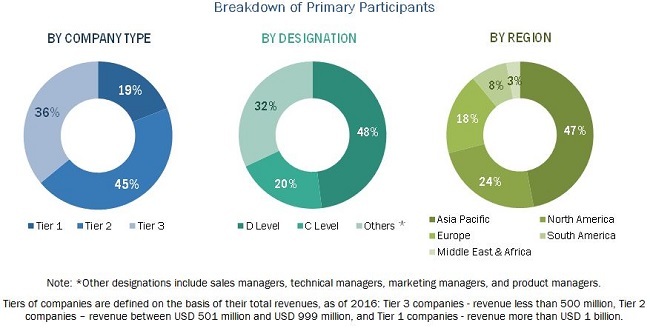 This research report categorizes the purging compound market based on type, process, and region, and forecasts revenue growth and provides an analysis of trends in each of the submarkets. Each process is further described in detail in the report with value forecasts until 2022. Each region is further segmented by key countries, such as China, India, Japan, South Korea, Australia, Taiwan, the US, Mexico, Canada, Germany, the UK, Italy, France, Netherlands, Belgium, Russia, Spain, Ukraine, UAE, South Africa, Kingdom of Saudi Arabia (KSA), Iran, Iraq, Egypt, Argentina, Venezuela, and Brazil. The purging compound market is projected to grow from an estimated USD 450.7 million in 2017 to USD 586.3 million by 2022, at a CAGR of 5.4% from 2017 to 2022. Compliance with various legal and administrative bodies for direct use with food products and medicines is expected to drive the purging compound market. Reduction in machine downtime, production costs, and raw material wastage is also expected to fuel the demand for purging compound. The purging compound market has been segmented on the basis of type, process, and region. Based on type, the mechanical purging segment led the purging compound market in 2016 owing to the increased use of purging compounds to manufacture plastic products. Based on process, the extrusion segment led the purging compound market in 2016. The North America region led the purging compound market in 2016, and is expected to grow at the significant rate during the forecast period, owing to the increasing demand for purging compound from countries such as the US, Canada, and Mexico. The increase in demand for purging compounds for their exceptional properties from end-use industries in the region are expected to drive the North America purging compound market. Mechanical purging compounds are used for cleaning of plastic processing machines. These compounds help in the removal of polymer residue by using abrasives or high viscosity plastics to mechanically scrub the contaminants from barrels and screws. The mechanical thermoplastic purging mixture contains a carrier resin and scrubbing granules, which are soft on the outside but remain solid on the inside; they clean metal surfaces safely and thoroughly, without wearing off the machine. Chemical/foaming purging compounds are increasingly utilized by plastic processing manufacturers, as they help minimize production costs and ensure optimal functioning of machinery. Chemicals are used to break down the polymer residue in barrels, screws, and other machines parts, to reduce the molecular weight and viscosity of polymers, which, in turn, helps in flushing them automatically from the machines. Chemical purging compounds are mostly preferred, due to their high moldability rate, as scrap generated can often be used to remold parts. Liquid purging compounds are concentrated and water-based additives, and typically act as surfactants that help in the removal of deposits from metal surfaces. The liquid purging compounds offer no soaking procedure for quick, easy, and safe cleaning of equipment, and are non-flammable, non-toxic, non-abrasive, colorless, and odorless in nature. What are the upcoming industry applications for purging compound? Pre-mixed purging compounds are more expensive than the compounds that require formulations. Therefore, high prices of purging compounds are expected to be the major inhibiting factor for the growth of the purging compound market, especially in emerging economies, such as India and South Africa. Huge investments are being made by various key companies, such as Asahi Kasei Corporation (Japan), Chem-Trend (China), Purgex (U.S.), Dyna-Purge (U.S.), 3M Company (U.S.), Clariant AG (Switzerland), VELOX GmbH (Germany), E. I. Du Pont de Nemours and Company (U.S.), Kuraray Co., Ltd. (Japan), Daicel Corporation (Japan), The Dow Chemical Company (U.S.), Formosa Plastics Corporation (Taiwan), CALSAK Corporation (U.S.), Reedy Chemical Foam & Specialty Additives (U.S.), Magna Purge (U.S.), and RapidPurge (U.S.), among others to meet the increased demand for purging compounds from the growing plastic processing equipment industry across the globe. New product launches and acquisitions are the key strategies adopted by leading players to strengthen their positions in the global purging compound market.